University Scholar Series: Alison L. McKee, Ph.D. 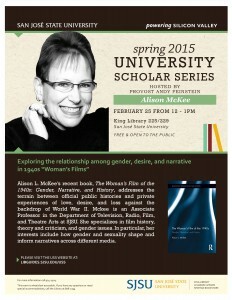 Associate Pr ofessor Alison McKee has been invited to participate in the Spring 2015 University Scholar Series to chat about her recently published book on “woman’s films” of the 1940s — movies that focus on love, desire, and loss against the backdrop of World War II. For a fun and informative talk that is open to the SJSU community and the public, please join her on Wednesday, February 25, from noon to 1 p.m. in the Martin Luther King Library, Room 225/229. 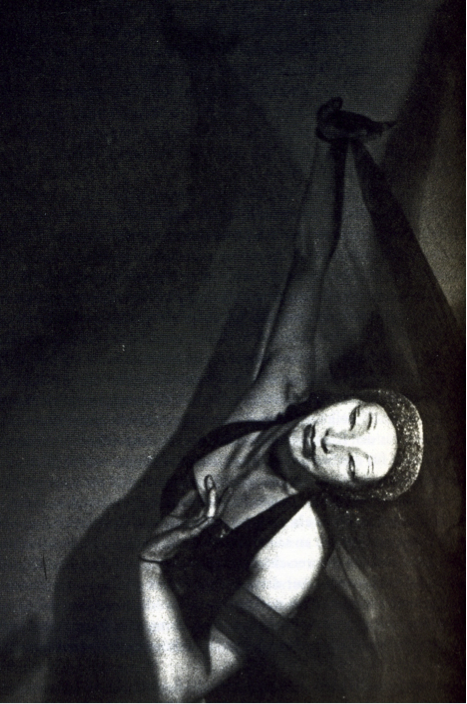 Comments Off on University Scholar Series: Alison L. McKee, Ph.D.
Oda Schottmueller performing one of her solo mask dances in Berlin, ca. 1938. Congratulations“Solo Dancing in Central Europe and Early Modernism,” in On Stage Alone, edited by Claudia Gitelman and Barbara Palfy, University Press of Florida, 2013. This article discusses different kinds of solo dance and dancers in Central Europe from about 1905 to 1940 and describes the remarkable inventiveness of dancers in developing a mode of dance performance that is now very rare and difficult to master in our time.